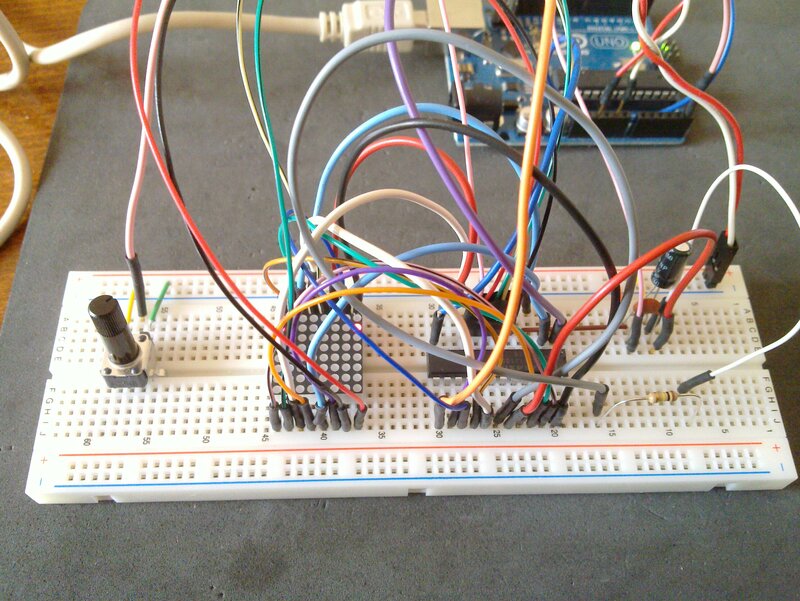 2012-03-09 by Alessandro Pasotti filed under Arduino, Tech, Programming. Last night I had an hard time wiring a coupful of connectors to drive an 8×8 led matrix, my breadbord is now really a jungle of wires! Given that I had no datasheet for the led matrix, I tried several combinations of wiring schemes until I found the right one on http://arduino.cc/playground/Main/DirectDriveLEDMatrix. Wiring that beast is tedious and making mistakes is really easy, but after a few tries I could successfully run the test sketch. Second question was what (possibly useless) object to make with the matrix, I saw some cool projects on the net, the most exciting being a ping-pong clone at http://blog.bsoares.com.br/arduino/ping-pong-with-8×8-led-matrix-on-arduino. Since I just have one potentiometer I choose a simpler variant, and I tried to implement the whole game from the ground up without looking at someone else’s code. 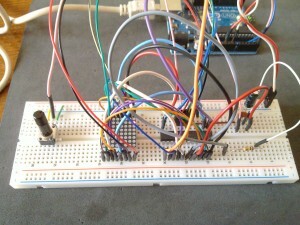 To drive the matrix I used a MAX7219 chip which only takes three Arduino pins, it has a nice library: http://arduino.cc/playground/Main/LedControl which allows to light single leds, rows and columns independently. I also used the great http://arduino.cc/playground/Code/Timer library to adjust the ball speed. This video shows the results of my efforts. The code still needs some polishing, but it’s basically working. Can you upload the timer libary. On the arduino page the file is down. Can your sketch be downloaded? Yes, you can copy the code above. could you also please post the the schematic diagram of the circuit?? I’d be happy to post the schematics, but I don’t have it.